Brushless DC geared motors simple construction and long life have earned them a place in a extensive variety of applications. These compact brushless DC gear motor are available on a range of voltages. Speeds are adjustable and the controller is integrated. Configuration allows for reverse rotation. 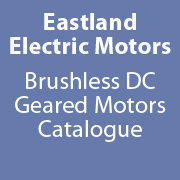 Our range of variable speed brushless gear motors include a number of mounting solutions for varying applications and uses. We carry a broad range of models to power or drive industrial and business machines. These motors are rated for continuous duty are reversible and very reliable.